By ordering you accept these Terms & Conditions. Order Reference: fill in Purchase Order number in "Customer : Order Reference." Delivery Address: the email address specified will be used for email order confirmation and to send the sequencing data. If the full order fails, sequencing will be repeated once to exclude errors in our experimental procedures. Short Run : 750 bp read max, on average 550 bases. 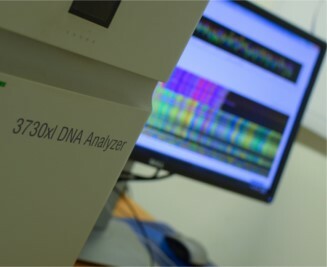 Recommended for sequencing PCR and short templates. Long Run : 1000 bp read max, on average 800 bases. Recommended for plasmid and long template sequencing. For good quality data, minimum length of the template above 120 bases is recommended. Please keep in mind that one order CANNOT contain two different "Read Length" options. An order is either "Short Run" or "Long Run". Use one line per sequence. Fill in all needed information. The columns "Template" and "Primer" are combined to constitute sequence filename. This combination should be shorter than 20 characters; additional characters will be truncated in the filename. For templates delivered in tubes, specify unique number in the column "ID/WELL" starting from 1 (1, 2, 3…) for every template in an order. This ID number should be clearly written also on the template tubes. For templates delivered in a 96-well plate, specify well locations in the column “ID/WELL” . If more than 1 plate is delivered, also indicate the plate name which is unique to every plate. Name of the template, will be used in the filename. Name of the primer, will be used in the filename. Indicate whether your template is a PCR fragment or a Plasmid. Indicate how the NSF has to clean your template. Leave empty if no purification is needed. This column is obligatory for PCR fragments. Indicate the size of your PCR fragment. Indicate the GC percentage of the sequence if it is known. In case the GC content is more than 65%, a special sequencing protocol is needed. Please enquire for this option. All template plates and tubes should be labeled with unique number (tubes) or identifier (plates, Valid Plate format). All primer aliquots should be clearly and unmistakably marked with unique ID, identical to the column ‘primer’ in ESS. Sequencing primer : 5 pmol/µl. Volume: for both, primer and template, supply at least 10 µl for each sequencing reaction that needs to be performed with the combination.